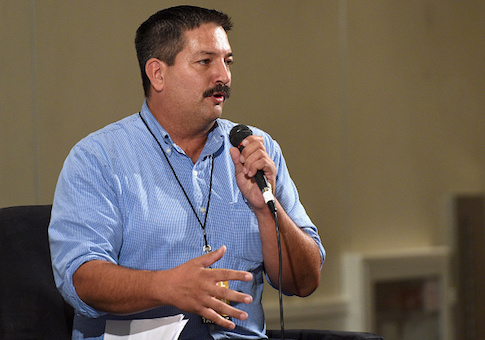 Wisconsin Democratic congressional candidate Randy Bryce, who is vying to replace House Speaker Paul Ryan (R., Wis.) in November, previously listed Joe Cardinali on his campaign website as an elected official who endorsed him, but that endorsement was recently removed after a volunteer for the Bryce campaign requested a restraining order against Cardinali for harassing and "intimidating" her. A 49-year-old woman who works for the Bryce campaign requested the temporary restraining order late last month, just one day after Cardinali, 22, was sworn in as a new member of the Kenosha County Board of Supervisors, Kenosha News reported. After the restraining order was issued, Cardinali and the woman attended a hearing last week on a permanent injunction, at which the accuser agreed to Cardinali's request that the hearing be rescheduled to Nov. 12, after the midterm elections. Kenosha Circuit Court Commissioner Christine Gabron extended the restraining order until the hearing takes place. In her filed statement, the woman accused Cardinali of "intimidating" her for six months, continually reminding her that he has "power" in the district, and attempting "to take [her] out to places for drinks and to engage in sexual behavior." Cardinali's repeated calls and text messages came at "all hours of the day and night … 10-20 calls and texts at a time," according to the woman's complaint. She added that some messages included graphic sexual remarks. Cardinali denied the allegations after appearing court, calling them "false." He confirmed that he sent two sexual texts to the woman, but said the two were being mutually "flirtatious." Kenosha News noted in a follow-up story about Cardinali that the 22-year-old Democrat "appeared by name as recently as Aug. 26 endorsing Bryce on the campaign website as an elected official." As of last Tuesday, Cardinali's name was no longer on Bryce's campaign website; the campaign did not issue an explanation for why they removed his name. The Washington Free Beacon reached out to the Bryce campaign to determine when the Democratic candidate knew about the allegations against Cardinali and why the campaign removed Cardinali's endorsement from the website without issuing a statement on the allegations. "Our campaign stands with survivors and respects their wishes on how, when, and if they wish to have their stories shared publicly," said Julia Savel, Bryce's communications director. "Our staffer chose to remain anonymous, and we respect her decision to handle this in a private manner. Her safety is our top priority." Savel did not address the Free Beacon‘s question regarding when Bryce was alerted of the allegations against Cardinali. The National Republican Congressional Committee slammed Bryce for touting an endorsement on his campaign website from someone who has been accused of harassing and intimidating his own campaign volunteer for several months. "It's disturbing that Randy Bryce would tout an endorsement from someone accused of harassing and intimidating his own campaign staff," said NRCC spokesman Chris Martin. "Randy should reveal exactly when he learned about these incidents—which apparently went on for months." This entry was posted in Politics and tagged NRCC, Paul Ryan, Randy Bryce, Sexual Harassment, Wisconsin. Bookmark the permalink.